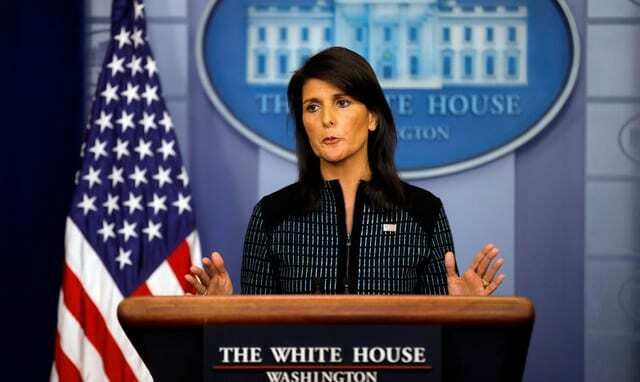 The United States will “unquestionably veto” a UN draft resolution calling for the protection of Palestinians in Gaza and the West Bank, US Ambassador Nikki Haley said ahead of a Security Council vote on Thursday. Kuwait presented the draft two weeks ago, initially calling for an international protection mission for the Palestinians as protests turned violent on the Israeli-Gaza border. “The resolution calls on Israel to immediately cease its actions in self-defense, but makes no mention of Hamas’ aggressive actions against Israeli security forces and civilians,” Haley said in a statement. She also delivered a blunt warning to European countries and others on the council who decide to back the Kuwait text. Diplomats have said the Palestinians may turn to the UN General Assembly to win support for the measure if the vote fails at the Security Council as expected. A draft resolution requires nine votes to be adopted in the 15-member council and no veto from the five permanent members — Britain, China, France, Russia, and the United States. “Those who choose to vote in favor of this resolution will clarify their own lack of fitness to take part in any credible negotiations between the two parties,” she said. The United States circulated its own draft resolution demanding that Hamas “cease all violent activity and provocative actions, including along the boundary fence” between Israel and Gaza. The UN envoy for the Middle East, Nickolay Mladenov, this week warned the Security Council that Gaza was on the brink of war following a serious escalation between Israel and Palestinian militants in the Hamas-ruled enclave. An exchange of fire on Tuesday and into the early hours of Wednesday began with a barrage of rocket and mortars into Israel from Gaza, prompting Israel to respond with strikes on 65 militant sites in the Gaza Strip. At least 122 Palestinians have been killed by Israeli fire in the unrest since the end of March. So far only a few injuries have been reported to Israeli citizens and no Israelis have been killed.